Photo of statues of the Famous Five (women) entitled Women are Persons! in the grounds of Parliament Hill, City of Ottawa, Ontario, Canada. Bronze statues of the Famous Five (women) wonderfully titled Women are Persons! in the grounds of Parliament Hill, City of Ottawa, Ontario, Canada. 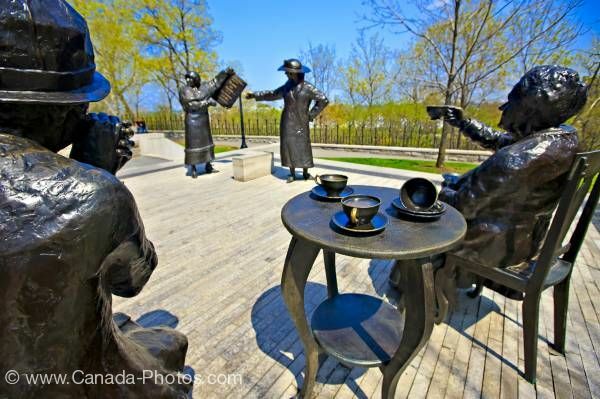 Bronze statues of women having tea displayed on a wood platform on the grounds of Parliament Hill. Two women, as they sit drinking their tea, look at the other women. A table sits between the two women with three cups of tea. Statues of the Famous Five (women) entitled Women are Persons! in the grounds of Parliament Hill, City of Ottawa, Ontario, Canada.